A free rinsing alkaline cleaner that can be used on floors and washable surfaces. Can be applied by rotary machine or scrubber dryer machine. A Turquoise liquid with lemon fragrance. This chemical is most effective on surfaces that a neutral maintainer does not respond to. Good for use on plastic, laminate and concrete surfaces. 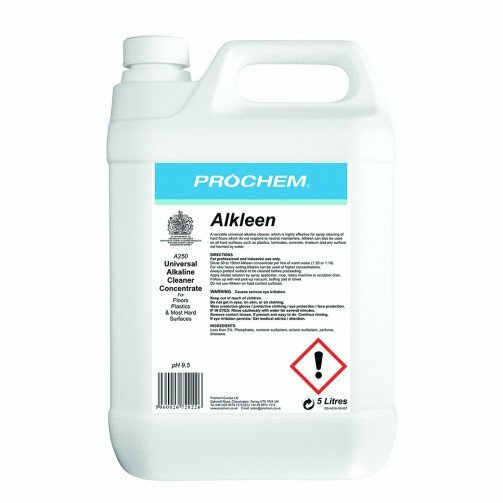 Prochem chemicals have a worldwide reputation for outstanding performance in the professional, commercial and institutional cleaning sectors. Specialist products cover a whole range of commercial and domestic environments for carpets, fabrics and floors. Chemicals are developed in-house to meet strict performance, safety, quality and environmental criteria.